BANANZA AIR MANAGEMENT SYSTEMS, is dedicated to producing the highest quality gas-fired heating equipment. With over 40 years experience in the direct gas-fired and SPRAY-CURE technology, together with TECHNOCURE Spray Booths we offer the highest quality heaters at the best value. BANANZA AIR MANAGEMENT SYSTEMS & TECHNOCURE offers the longest standard warranty in the direct gas-fired heating industry. We warrant our equipment to be free from defects in material for a period of 24 months (2 years) from date of installation. We also encourage you to have all installations and start-ups done by a trained or licensed installer. BANANZA - TECHNOCURE heaters have low-cost installation with advanced SPRAY-CURE technology, which is the most cost-efficient way to operate a spray booth. The BANANZA - TECHNOCURE SPRAY-CURE process allows you to cure the finish on a vehicle in the shortest amount of time possible. The BANANZA - TECHNOCURE SPRAY-CURE heater increases productivity and the new TECHNOCURE DELUXE DIGITAL SYSTEM increases it further. Maintenance on a reliable BANANZA - TECHNOCURE heater is simple. You'll save both time and money over conventional heaters because there are no heat exchangers, flues or reflectors to clean and maintain. The heaters are built using only the best available brand name components. BANANZA - TECHNOCURE emphasizes quality and reliability with all heater components being UL, CSA, or AGA listed. BANANZA AIR MANAGEMENT SYSTEMS & TECHNOCURE Spray Booths, SPRAY-CURE models are manufactured in compliance with the American National Standards Institute (ANSI) standard for direct gas-fired industrial air heaters. In addition, BANANZA & TECHNOCURE's product line is certified by the Intertek Testing Services (ETL). BANANZA - TECHNOCURE heaters are perfect for applications requiring safe, efficient heating and ventilation systems. See Standard Marks Below. BANANZA - TECHNOCURE SPRAY-CURE & heaters bring in a controlled amount of fresh, tempered outdoor air, which keeps debris from entering your spray booth. This positive pressurization in a spray booth improves operation by flushing out dirt, overspray, and fumes. The result is quality paint jobs from your spray booth. BANANZA - TECHNOCURE heaters can be mounted indoors or outdoors, vertically or horizontally to meet the space demands of your shop. These heaters can be used with Down Draft, Semi-Down Draft, Side Draft , Cross Draft and Truck & Equipment Spray Booths. BANANZA - TECHNOCURE also provides makeup air for Prep Stations. BANANZA - TECHNOCURE's direct gas-fired SPRAY-CURE heaters are 100% thermally efficient, which means that all of the heat generated by combustion is released into your spray booth. There is no heat lost up a chimney, flue or through a heat exchanger. This is a fuel savings feature that can't be found with an indirect fired heating system. Enclosed, Weatherized cabinet of heavy duty, corrosion-resistant galvanized steel Painted White. Oversized hinged access doors for ease of maintenance. 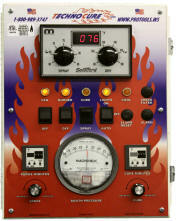 Solid-state Maxitrol modulating temperature control system. Direct-spark ignition for fuel savings. Double-width, double inlet, forward-curved centrifugal blower. 120-volt & 24-volt control transformers. The most reliable flame detection using a Honeywell Ultraviolet (UV) scanner. Two (2) manual gas shut-off valves. Adjustable motor bases for easy belt tensioning. Pre-piped and pre-wired for quick and easy single-connection installation. Certified by the American Gas Association and the Automotive Service Association. All controls UL, CSA, or AGA listed. Conforms to ANSI STD Z83.4, ANSI STD Z83.4A. Canadian Standards Association. Certified to CSA STD 3.7, CSA STD 3.7A. specifically for SPRAY-CURE applications.